Google has announced a 'bundle of browser goodness' for PC users, with the out-of-beta launch of Google Chrome Extensions. 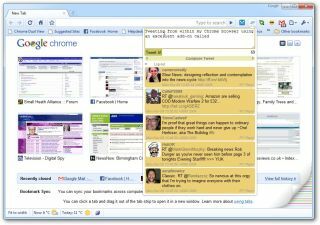 The beta version of this service has been around since December 2009, but now Extensions is available for stable browsers everywhere and there are 1,500 features ready and waiting for users to add to enhance their browsing experience. Those au fait with Firefox will now how much help an extension can be, and some of the most useful for Chrome have, unsurprisingly, a Google slant. These include: on-click access to Google Dictionary, Google Mail Checker and Chromed Bird, which allows you to interact with your Twitter account. Another new feature which has left beta includes Bookmark Sync. This allows those with multiple machines to sync up their Chrome browsers so that bookmarks are carried across all machines. Google is also proudly announcing that it has improved its browser performance by 42 per cent since its last stable release. If you are a Linux user then Google Extensions is still in beta and, unfortunately for Mac users, there's no sniff of Extensions or Bookmark Sync just yet. Google is hoping these will be with you "soon". If you want to learn more about Google Extensions, then go to Chrome.google.com/extensions. Watch the video below to see a rather nervous Nick from the Google Chrome team talking about all the new features.